The Martin CX 4 is a versatile, automated profile color and pattern changer utilizing a 6000 hour, 150 watt discharge source. The second in the Martin CX 4 series of stylish color changers, the Martin CX 4 can add a splash of color and unique pattern to any club environment, or subtle shades and textures to any architectural element. A color wheel combines with a color/effect wheel to offer a whopping 77 different color possibilities. The color wheel houses 6 solid colors and open white, 3 CTC filters plus a multi-color option. The color/effect wheel houses 6 solid colors, 4 gobo patterns and 5 beam reducing gobos plus a frost effect and variable strobe effect. An ultra-smooth, full range mechanical dimmer is also included. 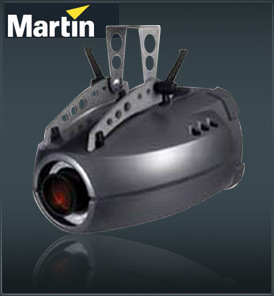 The Martin CX 4 is DMX controllable or operates in stand-alone or master/slave mode. Extremely versatile, the Martin CX 4 is the definitive color and pattern changer for both club and architectural environments.